Some people have music on in the background when they are writing. I don’t tend to do that, but there is sometimes a particular piece of music or song that I associate with something I am writing. With Cold, Cold Heart, the Hank Williams classic actually gave me the title as well as playing a small part in the novel and I often listened to it before I began the day’s writing. It seemed to tune me into the novel. In the one I’m writing now there is a nod to Elvis singing ‘The Girl of My Best Friend.’ As I listened, I was suddenly young again and it was a sunny summer’s day in August 1977. I was in my boyfriend’s car and we were driving out of Sutton Coldfield and it came on the car radio: Elvis had died. I can see that stretch of road. There are very few famous people of whom I can say that I have a vivid sense memory of where I was when I heard of their death – John Lennon, Princess Diana are others – and I suppose that what they have in common is that their deaths were shocking and premature. 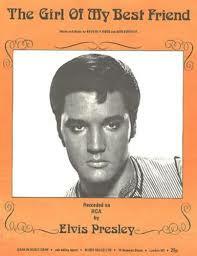 I wasn’t even a particular fan of Elvis – I was too young for that – but I felt the pathos of his early death. I feel it even more now that I am so much older.